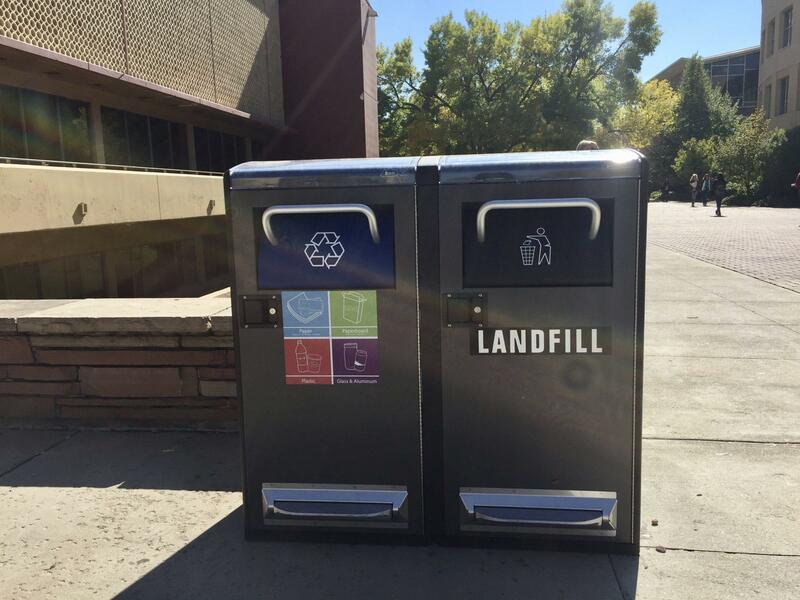 FORT COLLINS – A few weeks ago, the Integrated Solid Waste Program introduced new solar paneled trash cans to the CSU campus. I contacted Sheela Backen, the program’s head manager, for further insight into how the idea came to be and how these trash cans are improving campus. The idea to introduce these solar paneled bins to campus was inspired by their success at Georgia State University. Sheela explains that their door-like lid helps the material stay inside the bins which helps keep campus cleaner. The trash and recycling bins also have an electronic mechanism that will compact the material inside, allowing the bins to be emptied less frequently. When the bins are full, an email is sent to Sheela’s department, and the amount of material in the bins can be seen online. One of the new solar-powered trash cans outside of Clark A. The solar panels on top of the bins help provide energy to run the crushing and email mechanisms. Sheela explains that these trash cans are worth the investment as they have made her department much more efficient. So far, these bins require emptying around once a week contrary to the three times a week required without the crushing feature. The grounds section of Sheela’s department has also benefited since less material is flying out of these trash and recycling bins. Recycling can be complicated, so Sheela shared some tips to simplify the concept. She explained that only recycling materials you know are accepted can prevent incorrect recycling. It is better to not recycle an item than to incorrectly recycle it. Some common items to avoid recycling are Styrofoam -as it is financially demanding for recycling centers- and plastic bags. She also mentioned that plastics numbered 3, 6, and 7 (on the triangle on the bottom of a plastic), like red solo cups, are not currently accepted in recycling bins. “…these trash cans are worth the investment. While trash and recycling bins on campus have been upgraded by this project, composting seems to have been left out. However, an ongoing project Sheela mentioned brought composting into the discussion. In the near future, there will be a bin in the CSU bathrooms specifically for paper towels, which can be composted. There will be a separate bin for regular trash. She also said there are plans to expand composting services to our Foothills and South campuses within the next few years. All in all, the new bins on campus are making the Integrated Solid Waste Program more effective, allowing them to focus on future projects like expanding our composting services. Mia Sawaya is the local news reporter for The Rocky Mountain Review. She studies Philosophy at CSU and is currently covering recycling-related issues in Fort Collins.